Fannie Marie Grizzle Keen, 84 years of age of Bristol, VA, passed away Saturday, December 8, 2018 at her daughters residence surrounded by her family in Saltville, VA. Born October 3, 1934 she was the daughter of the late Henry and Fannie Sparks Grizzle. 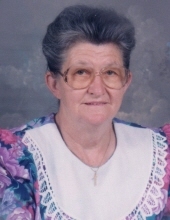 Fannie was of the Pentecostal faith and enjoyed gardening, quilting, horseback riding, and spending time with her family especially her grandchildren. She retired from Grundy Hospital working as a CNA serving her community proud. She was a loving mother, sister, grandmother, great-grandmother, great-great-grandmother, and aunt. In addition to her parents, she was preceded in death by her husband Andrew Keen and one daughter, Debbie Keen. Those left to cherish her memories include her daughters, Leta (George) Vandyke of Saltville, VA, and Leora (Larry) Cantrell of Whitewood, VA; two sons, Lonnie (Susan) Keen of Bristol, VA, and Henry (Tina) Keen of Meadowview, VA; and an adopted son Jerry Minter of Bristol, VA.
She is also survived by six grandchildren, six great-grandchildren, two great-great-grandchildren, several sisters and brothers and numerous nieces and nephews. A funeral service for Fannie Marie Grizzle Keen will be conducted at 12:00 noon on Thursday, December 13, 2018 at Shortridge-Ramey Funeral Home Chapel of Keen Mountain with Rev. Mike Justice, Rev. George Vandyke, and Rev. Anthony Hale officiating. Interment will follow in Peaceful Knoll Cemetery on Laura Creek in Whitewood, VA. The family wishes to extend a special thanks to Dr. Alison Whitman, the nurses and members of the New Century Hospice in Wytheville, VA, and the Community Home Care Service staff. The family will receive friends on Wednesday, December 12, 2018 after 6:00 p.m. with an evening service to begin at 7:00 p.m. at the funeral home. The family of Fannie Marie Grizzle Keen have entrusted the care of their loved one to Shortridge-Ramey Funeral Home of Keen Mountain, VA.
"Email Address" would like to share the life celebration of Fannie Marie Grizzle Keen. Click on the "link" to go to share a favorite memory or leave a condolence message for the family.